In the summer of 2013, the Connecticut Writing Project at Fairfield University hired Bridgeport teacher-of-the-year, Shaun Mitchell, to be a digital liaison and supporter of 21st century literacies. Mitchell provided Connected Learning between the teacher Invitational Summer Institute and Young Writers’ Institutes held on Fairfield’s campus. Mitchell, who teaches English and Drama at Central High School, previously received a 2012-2013 enhancement grant to improve technology in his classroom through National Writing Project SEED funds (Supporting Effective Educator Development). 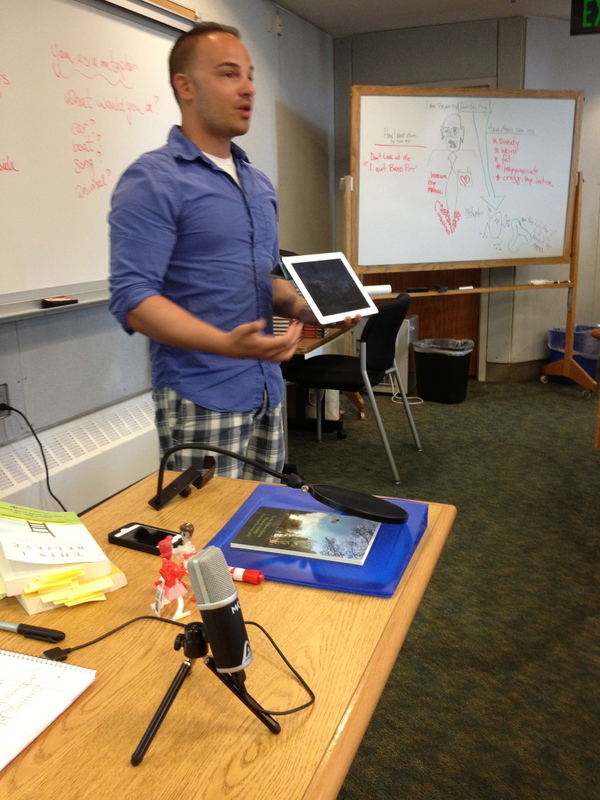 A 2011 fellow, Mitchell turned his IPad into a podcasting machine to record the stories of his students and produce them into podcasts from his classroom. Since then, he has presented his work at local and national conferences. Last April, Shaun Mitchell joined CWP teachers, Julie Roneson (Discovery Magnet in Bridgeport) and Kelley Gordon-Minott (Stamford High School), to present “Textual, Textured, and Tech-tual Lineages: Supporting Multiliteracy Exploration for the 21st Century Classroom” in Birmingham, Alabama at the Urban Sites Conference of the National Writing Project. The Connecticut team also participated in Lessons of the Birmingham Movement: A Symposium on Youth, Activism & the Struggle for Human Rights. To prepare, the presenters read several pieces by Dr. Alfred Tatum on advocating for the textual lineages of youth that represent their cultural-historical backgrounds. After a summer of collaboration with Tatum’s writing in 2012, the teacher team realized their own textual lineages were technological and textured, as well. In order to promote Connected Learning in their classrooms, they realized, their definition of a literacy lineage needed to be updated and expanded to meet the demands of the 21st century. Young people in 3rd, 4th, and 5th grade who attended a one-week program were the first to be featured: CWP-Fairfield Connected Learning – Young(er) Writers. During the second week, Mitchell interviewed students in 6th-12th grade who took part in CWP’s first two-week summer session: CWP-Fairfield Connected Learning – Young Writers, Session I. The third week featured the writing and thinking of teachers who attended the four-week Invitational Summer Institute: CWP-Fairfield Connected Learning – The Teachers. As a final broadcast, Mr. Mitchell promoted the thoughts of young writers who attended the second session: CWP-Fairfield Connected Learning – Young Writers, Session II. Shaun Mitchell’s work has also grown into the 2013-2014 school, as well. Recently, he collaborated with a graduate class at Fairfield University as he assisted his high school students in an exercise of writing 10-minute plays – a genre that brought tremendous success to Crandall’s students in Louisville, Kentucky, (an influence of the Louisville Writing Project). Mitchell’s high school writers sent early drafts to Crandall’s graduate students for feedback and, in in February, the top scripts will be produced and performed by Central High School’s drama department. Mitchell and Crandall hope to create digital narrations of the work, as well.